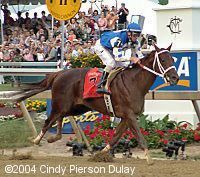 Smarty Jones winning the Preakness. Sadly Smarty Jones' owner Roy Chapman died today at age 79 of complications from emphysema, a respiratory disease he had battled for years. Go here for more about Chapman. On Saturday, June 5, Smarty Jones went into the gate at Belmont Park hoping to make history. Although he was not successful in his attempt, ending his career winning streak at eight, his is still a remarkable story and one that race fans hope will continue. Just five weeks earlier, the Pennsylvania-bred silenced his critics by capturing the Kentucky Derby as the 4-1 favorite, and then extended his undefeated streak to eight demolishing the Preakness field by 11 lengths at Pimlico. He quickly became one of the most popular horses in recent memory, even moreso than the New York-bred gelding Funny Cide a year ago, capturing the hearts and minds of racing fans and non-racing fans alike. Some began comparing him to the great Secretariat, winner of the Triple Crown in 1973. 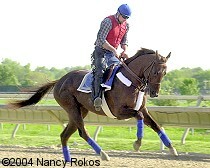 Smarty Jones works out at Philadelphia Park. He was treated like a star there with the track closing to all other horses so he could work undisturbed. Crowds of several thousand fans showed up just to watch. Courtesy of Nancy Rokos. Smarty Jones was bred at Someday Farm near Philadelphia by his owner, Roy Chapman, and was foaled on February 28, 2001. His sire is Elusive Quality who performed best at distances up to a mile, setting a seven furlong track record at Gulfstream Park and a world record at 1 mile on turf at Belmont Park in the Grade 3 Poker Handicap. His dam, I'll Get Along, was primarily a sprinter and was sired by champion sprinter Smile. Despite these influences, his Dosage Index of 3.40 suggested that he is capable of competing in the classics. He was named after Chapman's mother-in-law whose nickname was Smarty. Soon after Smarty Jones was foaled, Roy Chapman's trainer Bob Camac and his wife were murdered at their New Jersey farm, causing Chapman to consider getting out of the racing business altogether. He sold all of his racing stock except for two horses, one of which was Smarty Jones. Chapman said, "We had some bloodstock agents that were looking at other horses we were getting rid of and they did want to buy Smarty, but he was out in the field with his mama. I, thank God, decided to keep him and not sell him. He just had that look in his eye." The original Someday Farm was a 100-acre operation but it was sold during the horse sale and the Chapmans moved to a modest 11-acre plot in New Hope, Pennsylvania, which is the current Someday Farm. The two unsold horses were sent to Florida to be broken for racing, and then were returned to Philadelphia to the barn of John Servis, a friend of Camac. Servis, a native of Charles Town, West Virginia, scored his first win as a trainer in 1984 at Philadelphia, where his stable is still based. 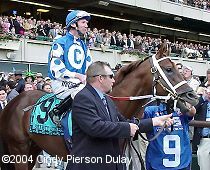 Before Smarty Jones, his last Grade 1 winning horse was Jostle in the 2000 Coaching Club American Oaks at Belmont Park and the Alabama Stakes at Saratoga, two-thirds of what is now New York's Triple Tiara. Besides Smarty Jones and Jostle, Servis' favorite horse he trained was La Grande Pos, because "he was a warrior and had such a long career." Servis' father was a jockey and managed the Jockeys' Guild for 11 years, then was a steward in West Virginia for 18 years. He started in the racing business working at O'Sullivan Farm near Charles Town, initially with the breeding operation then moving to the track to walk hots and groom horses. Moving to Philadelphia Park, he worked as a jockey agent, an assistant trainer to Mark Reid, then finally going out on his own. His first win as a trainer was with Belle River in 1984. When training for owner Rick Porter, he almost bought You and I, Thunder Gulch, and Tejano Run, stakes winners who would go on to successful stud careers, the proverbial "ones that got away". A few years later, Porter moved most of his stable to the barn of Nick Zito, the trainer who would deny Servis the Triple Crown. As a 2-year-old, during a schooling session at the starting gate at Philadelphia Park in July in preparation for his first career start, Smarty Jones reared up and slammed his head on an unpadded iron bar, fracturing his skull and shattering his orbital (eye socket) bones. Trainer John Servis said at the time, "Oh my God, this horse just killed himself." The accident nearly caused him to lose his left eye. It seems ironic that two of the other entrants in the Kentucky Derby were lacking sight in one eye and Smarty Jones could have been the third. After months of care at the New Jersey Equine Clinic, he finally made it back to Philadelphia on November 9, winning by 7 3/4 lengths in his debut. In his second start just two weeks later, he romped by 15 lengths. Servis said at the time to Chapman, "This is a nice horse. This horse could go somewhere." Chapman said, "John, only thing I want to go to, a horse like this I want to go to the Derby." After winning the Derby, Chapman said, "He laid me out a plan, and that day, I swear to you as I sit here, that day, here is what we are doing with this horse, and if he goes the way we'll say he goes, he'll go to the Derby. He did not deviate one inch. He ran it just the way he was going to run it that day. So without the Servis team, and Smarty's talents, we would not be here." Here being the Kentucky Derby winner's circle. Chapman spends his winters in Florida and briefly questioned why Servis wanted to winter in Arkansas instead. Servis answered, "Yes, that's a good place to train, there are some races out there that I think he can do well in, and we'll get to the Derby." Those races conveniently included the Rebel and the Arkansas Derby, which set Smarty Jones up for the $5 million payday put up by Oaklawn owner Charles Cella to celebrate the track's centennial season. Smarty Jones and Stewart Elliott head to the track for the Belmont Stakes. On the road to the Belmont, Smarty Jones pulled off a rather unique feat. He won the first eight races of his career, at eight different distances, at five different tracks, with the same jockey aboard. His maiden win was a 6 furlong sprint, and he followed those up with wins at 7 furlongs, 1 mile and 70 yards, 1 mile, 1 1/16 miles, 1 1/8 miles, 1 1/4 miles, and finally 1 3/16 miles at Pimlico. More amazingly, he not only won every race but always had the lead by the 1/8 pole never to let anybody by afterward. To some, the Belmont Stakes and the $5 million Visa Triple Crown bonus was all but in the bank. Unfortunately, the 1 1/2 mile distance of the Belmont might have proven too far for his miler/sprinter pedigree. Unable to relax as he had done in the Derby and Preakness, he set a blistering pace on the front end, going ten furlongs faster than he did in winning the Derby. 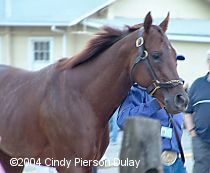 Regally-bred Birdstone, with a more distance-favoring pedigree, rallied from well off the pace, looked him in the eye inside the 1/8 pole, and for the first time in his career Smarty Jones yielded to a foe in deep stretch, obviously tired, while Birdstone coasted home clear by a length to deny him the Triple Crown. The loud cheers of the record Belmont crowd of 120,139 dropped to a deafening silence, quieter still than the moment of silence observed for President Reagan who passed away the same day. Trainer John Servis said of the performance, "Yeah, I think we finally got to the bottom of him yesterday. He's still a young horse. He'll mature and he's going to get better." Ever optimistic about his star, Servis added, "He's going to get three or four weeks just to rest up and then we'll get him ready and put him on a schedule and map out a plan for the Breeders' Cup. He came out of the race really good. I couldn't be happier. He ran hard and did a great job. We didn't get the total outcome that we wanted, but we had a really good ride. We've got more things ahead of us." It was also announced during the week before the Belmont that Smarty Jones would continue to race at four. Smarty Jones' jockey Stewart Elliott has won over 3,300 races, but until the Derby few outside Philadelphia had heard of him. 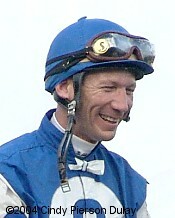 He is the first Canadian-born jockey to win the Derby and Preakness since Ron Turcotte aboard Secretariat in 1973. Born in Toronto, he left at the age of seven with his father, former jockey Dennis Elliott, for Hong Kong where Dennis rode for six years. Stewart began his career at the age of 16 at Philadelphia, but did "come home" to ride at Woodbine in 1987 winning 22 races. In his career he has competed at tracks in Pennsylvania, Florida, New Hampshire, Massachusetts, and Canada, but the Kentucky Derby was his first start at Churchill Downs. In the mid 1990's, he struggled with weight problems and quit riding for 1 1/2 years, remaining in the sport by galloping horses in the mornings, but decided he missed the competition. He said, "As I started getting a few years older, my body wanted to grow and then I struggled with it. But after taking some time off, I knew that I wanted it back, and I just tried to dedicate myself and work hard at staying light. Things have worked out." Of the racetrack life, with a jockey father and a show-horse rider mother, he said, "I don't know nothing else. This is it for me." After his Derby and Preakness wins, Stewart Elliott moved his tack to Monmouth Park in New Jersey, where he will continue to ride for John Servis but also for other trainers based there. 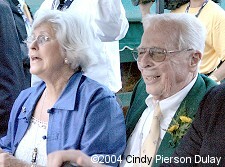 Roy and Patricia Chapman began breeding and racing horses in the late 1980's. 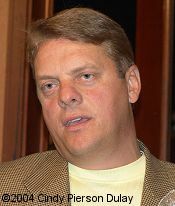 Mr. Chapman also owns a string of automobile dealerships, known as the Chapman Auto Group. The Chapmans won the 1989 Maryland Hunt Cup with Uncle Merlin, the first steeplechase horse they owned. Uncle Merlin also led the 1990 Grand National at Aintree, England, for much of the race until his jockey fell off at one of the final jumps. After the Derby, Roy Chapman admitted that he and his wife had received several offers to purchase Smarty Jones in the days leading up to the Derby. "I don't think this horse has ever got the respect he was really due," said Roy Chapman. "We've had a lot of offers and I've got the feeling we're going to get a couple of more now. I think the price might have just gone up a little bit." When asked how the farm's name came to be, Patricia Chapman said, "We thought about it for weeks after we moved in and we talked about all of the things we were going to do there some day, 'Some day, some day...' We were trying to tie a name in with the circle and the 'C' on the circle and nothing would work. Some day we were going to do this and some day we were going to do that. And my husband said, 'I think we ought to call it Someday Farm,' so we did."